Professional-Grade Pocket-Hole Machine at a Consumer-Friendly Price Built with professionals and hobbyists in mind, the all-new Foreman Pocket-Hole Machine is packed with features that will have you building with twice the speed and half the effort of a standard pocket-hole jig. The Foreman DB210 offers all of the same features and capabilities of our professional-grade machines in a machine that's versatile, portable, and extremely affordable. Extremely Easy to Setup and Use Create pocket holes with amazing speed and accuracy time and time again. Simply pull the large control handle to start the powerful 110-volt motor, clamp your workpiece securely in place, and raise the drill bit through the table. This simple operation drills a precisely-placed pocket hole at the perfect depth in materials from 1/2" to 11/2" (12-38mm) thick. Precise Pocket Depth and Repeatable Accuracy To ensure perfect pocket-hole placement, the Foreman DB210 features a tool-free adjustable fence that positions your workpiece for precise pocket depth, and a pair of adjustable, spring-loaded stops that provide repeatable accuracy. Plus, clear markings in the table make it easy to position the fence for your material thickness. 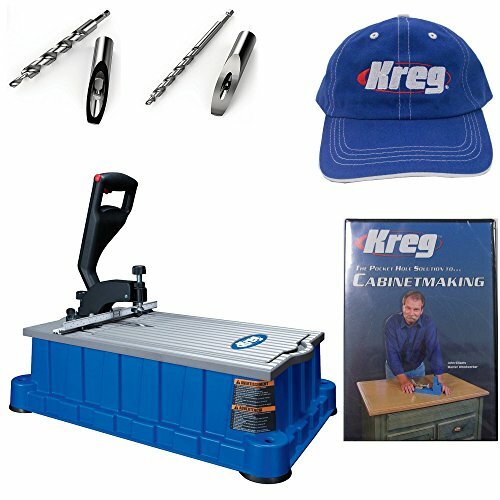 Creates All Three Types of Kreg JointsTM The Foreman comes with a standard 3/8" Kreg stepped drill bit to get you started-for materials from 1/2" to 11/2" (12-38mm) thick. It's also compatible with the Kreg® Micro-PocketTM Bit to create more compact pocket holes in thinner stock, and the Kreg® HD (Heavy-Duty) Bit for creating strong joints in 11/2" (38mm) and thicker stock. Portable and Durable, with Ample Workspace The Foreman's lightweight yet durable constructions allows hassle-free transportation-perfect for use in your shop, around your home, and on-the-go. Even with this portability, the Foreman still features a large table with ample workspace.